In 2012, for the first time ever, the EuroGames will be in a CEE (Central and Eastern Europe)-Country, namely in Hungary. This big and important sport event, which aims at making queers visible as part of society and fighting against any discrimination of non-heterosexual identities, will be in Budapest from 27th June to 1st July. Many activities at and around the EuroGames are part of the Football for Equality project. EuroGames, the European Gay & Lesbian Championships, is an annual European sporting event governed by EGLSF (European Gay and Lesbian Sport Federation). It is the biggest athletic event for lesbian, gay, bisexual and transgender people in Europe. The basic idea is to support gay and lesbian athletes in their coming out, increase the awareness of gay and lesbian sport in the greater public and to provide networking opportunities. The EuroGames 2011 in Rotterdam as well as the EuroGames 2012 in Budapest are held during the Football for Equality Project, and both are part of it. But the main focus of the FfE-activities concerning the EuroGames is a Twinning-project which aims at the exchange of Know-How, support and networking between the organisation commitees in Rotterdam and Budapest. The EuroGames-Twinning project module aims at exchanging good practice and practical Know-How between LGBT activists in the old and new member states on addressing homophobia in and through sport. In August 2011 the EuroGames took place in Rotterdam and in August 2012 they will be in Budapest - this is the first time that the sport-for-all event takes place in Eastern Europe. The two cities have presented a double -bid to give a clear statement: equal rights for every gay, lesbian, bisexual and transgender person in every part of Europe. Equal rights are not a fact of daily life in many parts of Central and Eastern Europe. Rotterdam and Budapest want to build a bridge between East and West. The two cities have linked themselves in order to give Budapest the opportunity to get experience in Rotterdam and Rotterdam will assist Budapest with hosting this first mayor Gay and Lesbian Sport Festival in a country of the former East bloc. Rotterdam wants to be the front runner in terms of equal rights for the GLBT community throughout Europe. Besides the exchange of activists, at both events – Rotterdam and Budapest – information work will be done (printing of info leaflets with a focus on the LGBT rights in the CEE sub-region). Also athletes fom CEE countries who normally could not afford to attend in the EuroGames for economic reasons, are supported financially. This measure increases active involvement in the pan-European event. 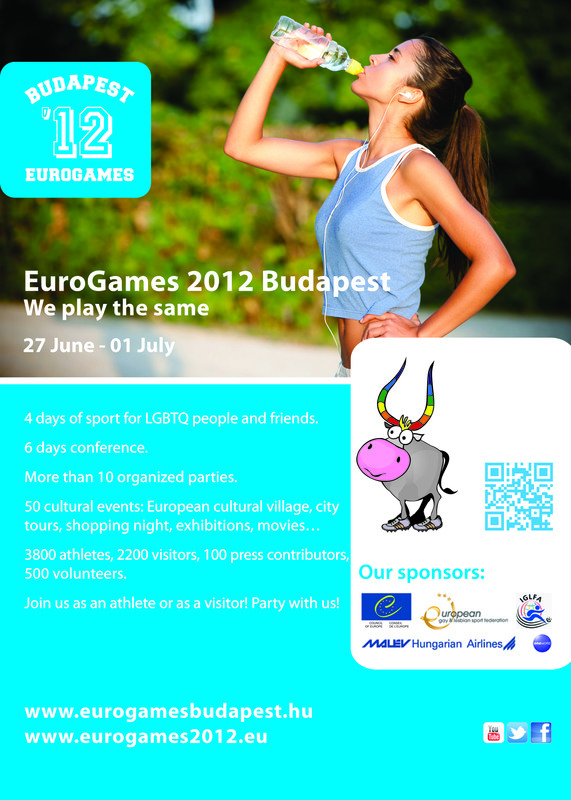 The 14th edition of the EuroGames will be this year, from 17th June to 1st July in Budapest, Hungary. The main organisation which will coordinate the EuroGames in Budapest is FRIGO (Fresh Thought Association). As one of the first LGBTQ sport clubs in Hungary FRIGO applied for hosting EuroGames in Budapest at the annual general assembly of the European Gay and Lesbian Sport Federation (EGLSF). Our joint application with EuroGames 2011 Rotterdam was supported by most of the delegates. With hosting the EuroGames in Budapest we would like to improve the reputation of Hungary as an open minded country with a tradition of hospitality and to support the Hungarian LGBTQ community. 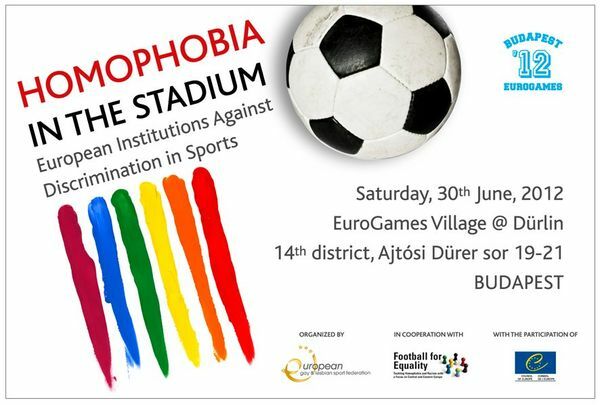 As the first bigger international LGBTQ sport event in Eastern Central Europe, EuroGames in Budapest would support the LGBTQ communities and their initiatives in the neighboring countries and in the region. We would also like to build bridges between the Hungarian LGBTQ community and the majority of the society and to improve the level of tolerance. FRIGO and the EuroGames is giving the chance for many amateur and professional athletes to live a healthy life while training for the competition and participating in it. The EuroGames is open for all regardless of one’s knowledge and level of sport, nationality, age, sexual orientation and gender identity. A mini conference entitled “Homophobia in the stadium” was organised in the scope of the FfE-project. There were six speakers, namely Sonia Parayre, Deputy Executive Secretary of the Enlarged Partial Agreement on Sport (EPAS), Uffe Elbaek, Culture Minister of Denmark, Tanja Walther-Ahrens, former football player, and representative of EGLSF, Megan Worthing-Davies, UK Justin Campaign- Football v Homophobia association, Louise Englefield, PrideSport-UK and former EGLSF co-president and representatives of the ENGSO Youth Study Session. In the framework of the conference also the English and Hungarian versions of the Touring Exhibition were displayed. In past EuroGames, participants from all areas of Europe, and even outside Europe, participated in this unique event. However, to ensure that as many Europeans as possible can take part in this event, participants from outside Europe are put on a waiting list until registration has closed. These people can join the competitions that are not yet full. 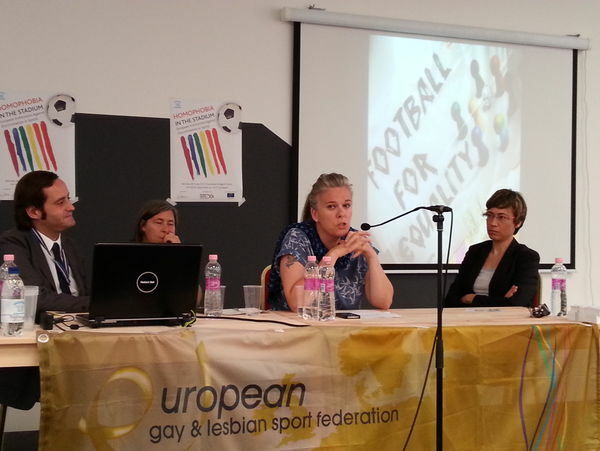 Conference Report "Homophobia in the Stadium"